Over here at Gatherhaus, we have been researching the pesky problem of plastics and its negative effects on the environment and our bodies. With information comes knowledge, and with knowledge comes power. With this knowledge, we have become highly convicted in our overuse of plastic and are working on finding ways to eliminate plastic from our lives. This is a really large topic to dive into. 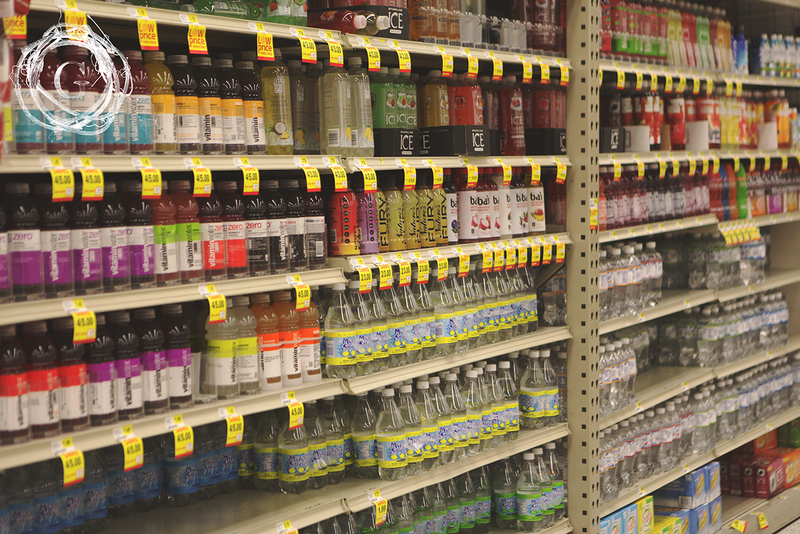 There is a focus on plastic and its harmful chemicals in our food and food storage. There is a large amount of research being done on what happens to our environment when plastics are thrown out. And many are frustrated at the connections between plastics and disease. Due to the overwhelming nature of this issue, we encourage you to do some personal research for where your heart is inclined in the issue. For us today, we want to focus on the waste of plastic and how it’s affecting our planet, and what are a few simple steps we can take to make a difference. If you are looking for a wake up call, check out images and research in regards to our waste habit with the The Great Pacific Garbage Patch. There are hundreds of living creatures and plants that are at risk of extinction due to the amount of garbage in our water. Coming in at more than 2 million, cigarette butts are the number one piece of garbage found, with plastic waste coming in second at 1 million. Over 13 billion plastic bags are produced each year, which accounts for roughly 300 per person per year! How can a society built on convenience, create a lifestyle that honors not only our home called mother earth, but respects our bodies and in extension, our communities? Here are a few simple steps that can start you on your journey towards eliminating harmful plastics from your life. When eating out, DON’T use a straw. It may sound simple, but that plastic is just getting thrown out, If you prefer using a straw, bring your own reusable stainless steel or glass straw. This also goes for lids if you are at a quick food joint. Leave them be. It’s unnecessary plastic. Please bring your own grocery bags when shopping. Leave a stash in your car! But if you forget, like I often do, opt for the paper bag instead. They decompose at a much quicker rate. Try try try to use a reusable mug or water bottle. You will be surprised how much of a difference in waste this makes! Use matches instead of the plastic lighters. Let’s be honest, match boxes are cool and old school anyway. And they smell amazing. It’s a win-win-win. As a mother with school age kids, I KNOW how convenient individual serving snacks are. In effort with Meatless Monday, maybe we could try Buy Bulk Wednesday. Buy the glass jar of applesauce instead of the squeezes. Buy fresh fruit instead of plastic cups of fruit in juice. Buy the family size box of crackers instead of the personal size wrapped package of six. This step alone is a bit more tricky, but the impact is profound. Odds are, you’re kids aren’t recycling them at school, so most of it ends up in trash. 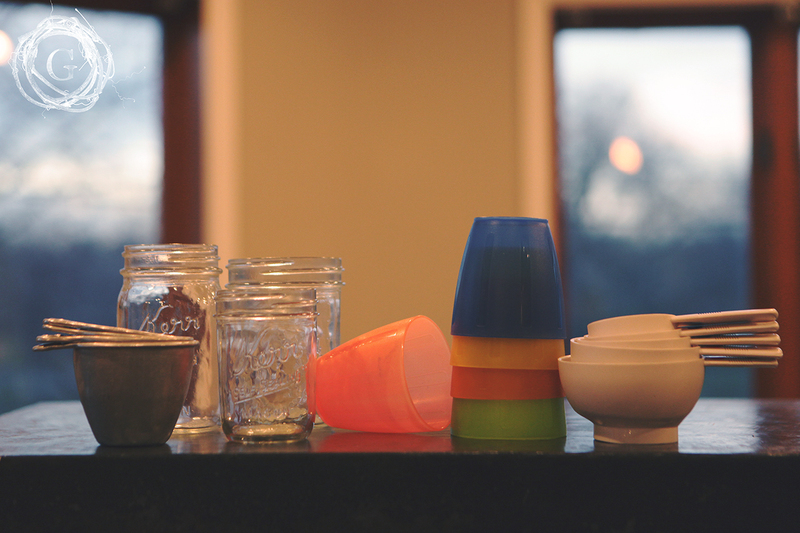 Start replacing plastic tupperware with glass containers as your budget allows. 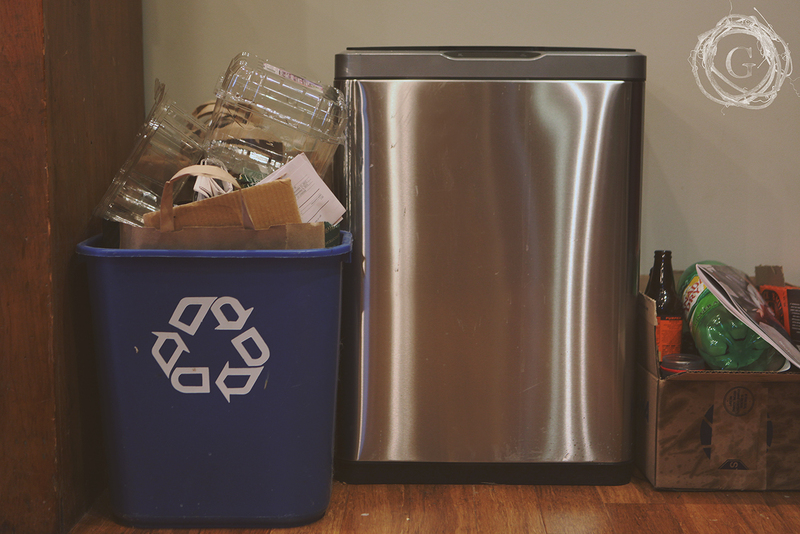 When discarding those plastics, make sure to recycle them and NOT throw them out! Ziplock bags fall in this category as well. Try to reuse them whenever possible by washing and air drying them. As you can, start to eliminate them whenever possible. Replace your plastic cutlery with real silverware. Don’t break the bank, hit your local thrift store on sale day and pick up a bunch. Store them for parties and family get togethers. It may be a smidge more work, but the global effect is well worth it. Your great great grandchildren will thank you. When purchasing plants in the spring, save those containers and bring them back to your garden store! It will reduce the cost of recycling the items, and help cut costs at your local nursery! Whenever possible, buy products that come in boxes over plastic. Laundry soap is a good example of this. Instead of the plastic container, buy the cardboard box instead. It decomposes SO much faster! Put a little time in looking for the alternatives to your conveniences. Bamboo utensils if you absolutely need disposable, wax paper to wrap sandwiches in for lunch, check out ingredients for beauty products to make sure you aren’t buying anything with microbeads, look at what is plastic in your home and see how you can replace it with another option. If you have something that HAS to be plastic in your life, reuse it…get creative..get as much life out of it as you can. But remember, some plastics can start leaching after one use (like bottles of water) so be cautious with this. And recycle AS MUCH AS POSSIBLE. Thanks for sticking with us in this. As a globally conscious people, we feel it is really important to do our part to take care of not only our home but each other. It won’t feel like a whole lot in the beginning, but we do believe, EVERY LITTLE step helps! This is especially true if children are a part of your lives, because the habits you create, are passed along to them doubling your impact. If you have other great ideas, please share! There is also a ton of information out there, so don’t be shy in researching this topic and finding ways to make an impact.